In August 2011, Flayrah published a favorable review of The Saga of Rex by animator Michel Gagné. The Saga of Rex is a surrealistic whimsical science fiction tale that is really just an excuse for Gagné’s incredible imaginative graphics. The plot, if you want to call it that, is that the Guardian-Shepherd of the planet Edernia (a godlike being) summons a fleet of Gathering Ships to fly throughout the galaxy and harvest (kidnap) “specimens” to transport into Dream Globes (alternate worlds) where they will serve as hero-champions for Edernia’s metamorphic sentient Blossoms. 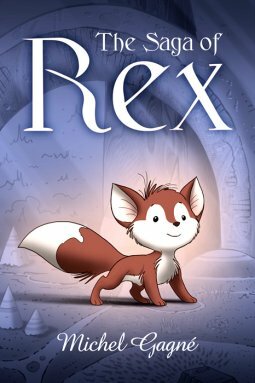 (Readers who want to find meaning in this are told, “Those secrets have been lost in the catacombs of time.”) Rex, “the adorable little fox” from Earth, becomes the specimen of Aven, a Blossom who comes to love Rex and transforms herself into a sometimes-winged blue foxlike mate for him. I think. As I said, just forget about plot and lose yourself in Gagné’s scintillating artwork. Rex’s Dream Globe is a wondrous, mysterious world that encompasses whole galaxies. It is full of strange, flowing, usually amorphous life forms, both benign and hostile. Rex rescues and is rescued by alien beings; he passes through trials of water and fire; he dies and is transmogrified into a savior. Basically, The Saga of Rex is 200 pages of mind-blowingly gorgeous semi-abstract s-f artistry. It is not to be missed. Now, Gagné has launched a Kickstarter project to raise $15,000 to start an animation studio and turn his book into a classically animated film. He has already gotten $12,152 in pledges, with 26 days to go. See his four-minute video explaining the project. Two days and $5000 later, the project has met its initial goal, attracted 363 backers and been chosen as project of the day. Will it reach $30,000, $45,000 or $52,500? There are a full 24 days to find out . . .
With about 18 hours to go, the project has 812 backers pledging just over $55,000.